Click here to go to my main page on End Times. Click here for my YouTube videos on the Rapture. There is so much happening in the world today that most people believe Jesus will return soon. In Matthew 24, Jesus gives us an overall picture of the worldwide events which will occur before He returns. In Matt. 24:1-5, when Jesus was asked about the sign of His coming and the end of the age, the first thing He said was, “Watch out that no one deceives you. For many will come in my name, claiming, 'I am the Christ,' and will deceive many”. This warning is of such great importance that Jesus repeated it twice more in Matt. 24:11,24 and, after speaking about false Christs, false prophets and the Great Tribulation, He said in Matt. 24:25, “See, I have told you ahead of time”. In these verses, Jesus has given us a very serious warning to be prepared for the possibility of facing the horrors of the Great Tribulation. So, let's look at the rest of Matt. 24. Matt. 24:6-7 say that there will be wars, famines and earthquakes (the word earthquake also means storms). These worldwide tragedies are occurring one on top of the other and many barely even make the newspapers. Disasters that are fresh in our minds are soon blotted out by new ones. Matt. 24:8 then says that these things are the “beginning of birth pains” so this means that greater pain will follow. If the 2011 Japanese tsunami is just the beginning of birth pains then what horror is yet to come? Next, Matt. 24:9-13 speak of Christian persecution, death, hatred, apostasy, betrayal and the deception of false prophets. During this time, evil will be so great that “the love of most will grow cold” (Matt. 24:12) and this is why Matt. 24:13 warns us to remain in Christ. It says, “but he who stands firm to the end will be saved”. Next, Matt. 24:15-22 again speak of the persecution and tell the Jews in Judea to flee when the Antichrist appears in the temple in Jerusalem because his appearance will be the beginning of great distress like never before seen in the world (this is called the Great Tribulation). Matt. 24:22 says that it will be so bad that, for the sake of Christians, those days will be cut short. Then Matt. 24:23-24 once again warn about false Christs and false prophets who will perform such great signs and miracles that even the elect may be deceived. In Matt. 24:25, Jesus warns us, “SEE, I HAVE TOLD YOU AHEAD OF TIME”. Then, in Matt. 24:26-29, after warning about false Christs again, Jesus says that His return will be seen by everyone, just like lightening is seen from the East to the West. He said not to believe people when they say that Christ was here or there but to look for the special sign of His coming. That sign is given in Matt. 24:29 which says, “the sun will be darkened, and the moon will not give its light; the stars will fall from the sky, and the heavenly bodies will be shaken” and only AFTER this sign will the Lord return. and then Matt. 24:30-31 tell us that, AFTER that sign appears in the sky, Jesus will be seen coming on the clouds and the nations will mourn because they know that they are about to be destroyed. Matt. 24:31 tells us that, at that time, Jesus will send His angels with a loud trumpet call to gather (rapture) the elect to be safe with Him while God's wrath is being poured out on the earth, ending with the war of Armageddon. So, it is quite clear that the church will see the Antichrist and go through great tribulation until Jesus returns to rapture believers and to destroy sinners. 2 Thess. 2:1-3 also show that the Rapture won't occur until after the Antichrist appears. In part, these verses say, “Concerning the coming of our Lord Jesus Christ and our being gathered to him [the Rapture] … Don't let anyone deceive you in any way, for (that day will not come) until the rebellion occurs and the man of lawlessness [the Antichrist] is revealed, the man doomed to destruction”. These verses clearly say that Christians will not be gathered to the Lord until AFTER the revealing of the Antichrist and that is exactly what Matt. 24 says. Many Christians believe that 1 Thess. 4:13-5:11 is talking about another gathering to the Lord. They believe that these verses say that Jesus will rapture the church before the Antichrist appears. However, Chart 1, below, compares 1 Thess. 4-5 to Matt. 24-25 and shows so many common points that it is clear that they are both talking about the same event. "For the Lord himself will come down from heaven, with a loud command, with the voice of the archangel and with the trumpet call of God, and the dead in Christ will rise first. After that, we who are still alive and are left will be caught up together with them in the clouds to meet the Lord in the air. And so we will be with the Lord forever" (1 Thess. 4:16-17). When will this happen? 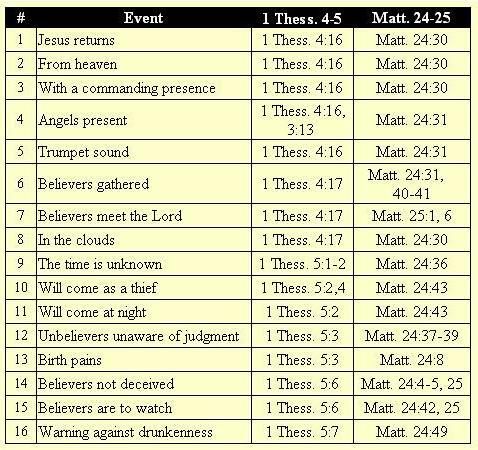 Further proof that Matt 24. gives the sequence of events leading to Jesus' return can be found in Chart 2 below. This chart compares Matt. 24 with Rev. 6-8 and a clear parallel can be seen between these two passages. The many similarities between 1 Thess. 4-5 and Matt. 24-25 make it very clear that they are describing the same event. There is only one return of Jesus and it is after the Antichrist appears and persecutes Israel and the church. When Jesus returns, He will first rapture His elect and then God's wrath will be poured out on the earth. Jesus Himself has given us both Matt. 24 and Rev. 6-8 and the obvious parallel is further proof that Matt. 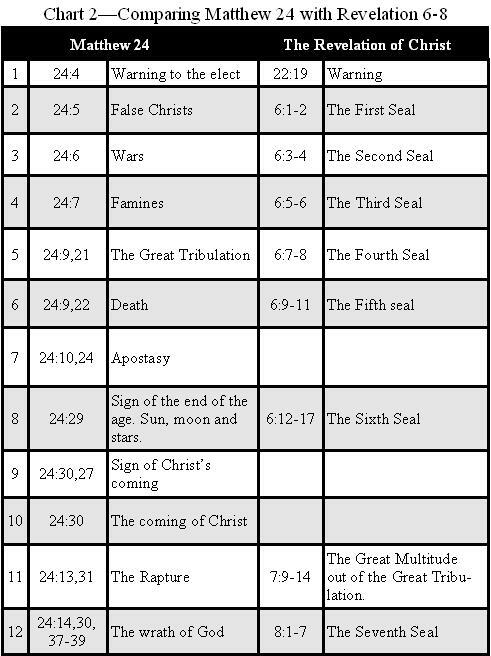 24 is the sequence of events leading to Jesus’ single return. (The charts in this article have been copied from http://www.scriptorium.org and The Rapture Question Answered, by Robert Van Kampen). Other passages, like Luke 17:22-35 and 2 Thess. 1:6-11, show that on the day that the Lord returns He will first rapture His people and then punish sinners who are left on the earth. There is not one verse which says that the Rapture will occur before the Antichrist appears. The Antichrist is a man who will be fully possessed by the devil. In effect, he will be the devil in the flesh. Through the Antichrist, the Devil will try to destroy Israel and the church in order to stop God's plan for mankind because he know that, after God's plan is fulfilled, he will be tossed into the lake of fire forever and ever (Rev. 20:10). We are told that the Devil will give the Antichrist his power. In Rev. 12:7-17 it says that there will be war in heaven and Michael will hurl the Dragon (the Devil) to the earth. Then the Devil will be filled with fury and will persecute Israel (v.13) and Christians (v.17). He will do this through the Antichrist. In Rev. 13:1-2 the Antichrist is called the “beast coming out of the sea” and we are told that “the dragon [the Devil] gave the beast his power and his throne and great authority” and Rev. 13:7 says that “he was given power to make war against the saints and to conquer them. And he was given authority over every tribe, people, language and nation”, so the Antichrist will have the Devil's great power and authority to persecute and to deceive many. 2 Thess. 2:3-4 tell us a little more about the Antichrist. These verses say that “the man of lawlessness [the Antichrist] ... sets himself up in God's temple, proclaiming himself to be God”. Then, in 2 Thess. 2:9-10, we are told that “the coming of the lawless one [the Antichrist] will be in accordance with the work of Satan displayed in all kinds of counterfeit miracles, signs and wonders, and in every sort of evil that deceives those who are perishing. They perish because they refused to love the truth and so be saved”. So, we can see that the Devil will give his power to the Antichrist so that he can persecute God's people and do false miracles, signs and wonders to deceive people into believing that he is God. Because of the Antichrist's great power to do miracles, signs and wonders, Jesus warns Christians time and again not to be deceived but to stand firm to the end and wait for His return which will be like lightening and will be AFTER the sign in the sun, moon and stars. Why should Christians face persecution? Many people say that God would not allow His people to suffer the Antichrists' persecution but, besides the many examples of persecution in the Bible, Phil. 1:29 tells us that “it has been granted to you on behalf of Christ not only to believe on him, but also to suffer for him” and Rom 8:17 says, “Now if we are children, then we are heirs - heirs of God and co-heirs with Christ, if indeed we share in his sufferings in order that we may also share in his glory”. And Jesus said in John 15:20, “No servant is greater than his master. If they persecuted me, they will persecute you also” so it is not right to say that God would not allow His people to suffer. But why will God allow it when He could easily prevent it? Well, in Heb. 2:10 we are told that Jesus was made perfect through suffering and 1 Pet. 1:6-7 tell us that, through suffering, our faith is proved genuine and refined just like gold is refined by fire so suffering perfects us in the same way it perfected Jesus. Rom. 5:3-5 tell us that we should rejoice in our sufferings as “suffering produces perseverance; perseverance, character; and character, hope. And hope does not disappoint us, because God has poured out his love into our hearts by the Holy Spirit, whom he has given us”. In 2 Corinthians, Paul talked about suffering several times and in 2 Cor. 7:4 he said, “in all our troubles my joy knows no bounds” and, in Matt. 5:11-12, Jesus said, “Blessed are you when people insult you, persecute you and falsely say all kinds of evil against you because of me. Rejoice and be glad, because great is your reward in heaven, for in the same way they persecuted the prophets who were before you”. So, God uses suffering to prove our faith, to perfect us and to lead us to a great reward in heaven and it is God's promise that He will always be with us to carry us through hard times. In Rom. 8:35-39 Paul said that nothing can separate us from the love of God that is in Christ Jesus and in 2 Tim. 1:11-12 he spoke of his suffering and trust in Jesus to keep him - “And of this gospel I was appointed a herald and an apostle and a teacher. That is why I am suffering as I am. Yet I am not ashamed, because I know whom I have believed, and am convinced that he is able to guard what I have entrusted to him for that day”. Throughout the ages, many Christians have suffered and even been martyred for their faith and Jesus was always with them so we can be sure that He will also be with us in our trials. Finally, Jude 1:24 comforts us in saying, “To him who is able to keep you from falling and to present you before his glorious presence without fault and with great joy”. May we all say, “The LORD is my strength and my shield; my heart trusts in him, and I am helped” (Psa 28:7). Click here to download this article as a printable booklet (print on both sides of A4). Click here for a small article on Luke 17 and the Rapture. Click here for a very good little article on the words 'coming' and 'meet' as used in 1 Thess. 4:15-17. Click here to go to my main page on End Times. At the end of it there are links to some authors and articles on the PreWrath and Post Tribulation Rapture positions. Download The PreWrath View by Elbert Charpie. Because of graphics it is a large file, about 20MB. Download Of The Last Days, a free Post Tribulation book by Richard Perry.